For once, a French company is buying a relatively well-known US tech startup instead of the other way around: Kwaga has acquired struggling iOS and Mac push notification service provider Boxcar. Unfortunately, the terms were undisclosed. Paris-based Kwaga is the creator of WriteThat.name, a nifty online service that automatically updates the address book of emails and CRM systems by identifying contact information in the signature of emails received. 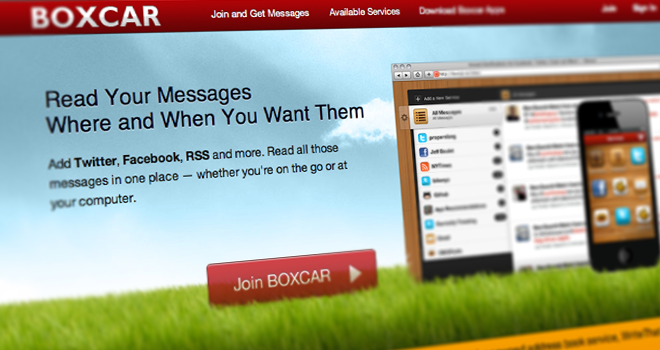 Boxcar was originally launched in 2009, and provides real-time notifications to hundreds of thousands of users via their iPhones or Mac desktops, keeping them up-to-date on social network interactions and changes in their favorite apps. The startup says it has issued over 2 billion notifications to date. According to its website, it was working on Boxcar for Android and Windows. Boxcar raised $150,000 in seed funding from (also French) investment firm Kima Ventures, and a little over $200,000 in total. Boxcar and Kwaga share the same philosophy of simplifying the daily digital lives of their users, whether at their desk or on-the-go; WriteThat.name users benefit from an address book that is always up-to-date, while with Boxcar, they receive personalized notifications on all activity from their favorite applications, be it email, social network, monitoring applications or even to their contacts. Jonathan George, the founder of Boxcar, is joining Kwaga’s board as an advisor and says he will “assist the Kwaga team in evolving its notification service”. That doesn’t sound like he plans to stick around for the long haul, unless I’m mistaken, although I’m told the service will definitely continue to be maintained and improved by Kwaga.